Spring migrations bring gray whales, California sea lions, and elephant seals up the coast. Our local harbor seals are ready to burst with new pups on the way. Yearlings are claiming their own territory, sometimes at a local marina! Before we know it, the hotline will be ringing off the hook and I’ll be calling you, my wonderful volunteers. We’re going to have plenty of strandings to respond to and seal pups to sit. And for those animals that unfortunately will get selected out of the gene pool (but stay fresh), we’ll perform necropsies to find their cause of death. There’s so much to learn about these wonderful mammals of the sea. With so much to look forward to, let’s first take a look back at 2014. It was a busy year, with a record number of calls on the hotline and strandings on the beach. So join us in seeing all the hard work we put in last year! Holy moly, we sure got a lot of calls on our hotline last summer! Does that mean there were more marine mammals getting stranded? Unlikely. We hope it’s because of our “Share the Shore” signs. Through our Prescott Grant, we have installed 21 signs across East Jefferson County. Not only are they beautiful, but they share valuable information to the public about marine mammals. Beaches are a great place for relaxation and recreation, but it’s often forgotten that beaches are also vital habitat for amphibious marine animals. 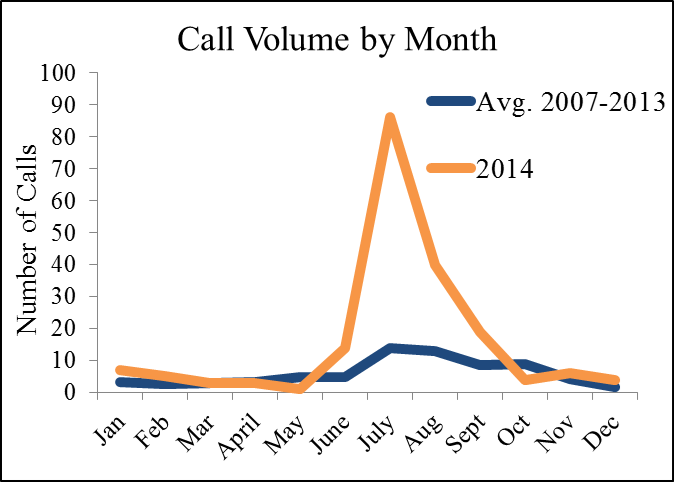 Above: Number of calls each month to the MMSN message-line in 2014 as compared to monthly averages from 2007-2013. The “Share the Shore” signs aren’t pulling all of the weight though. Rack cards distributed by volunteers to local organizations and businesses have also proved priceless in our education efforts! If you’re interested in helping with public outreach, check out page 6 for more information. Right: Locations of installed “Share the Shore” signs across East Jefferson County. Think you know a great place to install a sign? Let us know! How Many Marine Mammals are Reported Each Year? 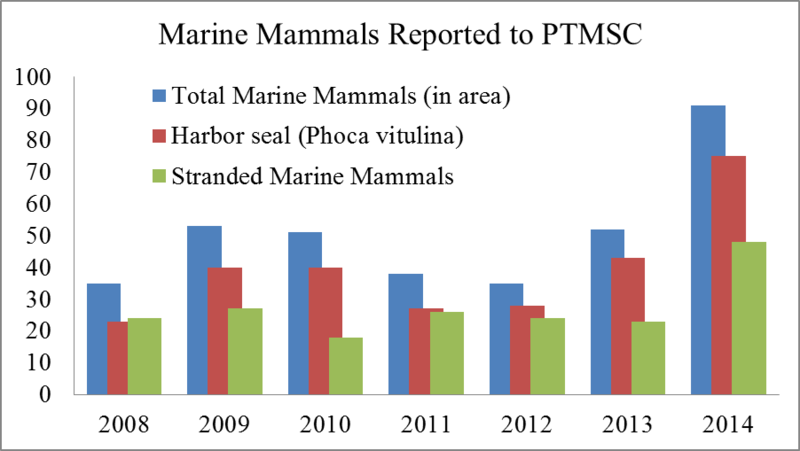 After a two year decline from 2011 to 2012, reports on marine mammals has steadily climbed in East Jefferson County. In 2014, we broke our record with 91 marine mammals reported! Of those 91 animals reported, just over half were actually stranded (whew!). Number of calls each month to the MMSN message-line in 2014 as compared to monthly averages from 2007-2013. 75 of those animals that were called in were harbor seals, yet again demonstrating the abundance of the species in our region. Many of those seals were not stranded, but pups hauled out on busy beaches. Luckily, we have so many wonderful volunteers willing to seal-sit these young animals. Seal-sitting has also been a great opportunity to educate the public about marine mammals. 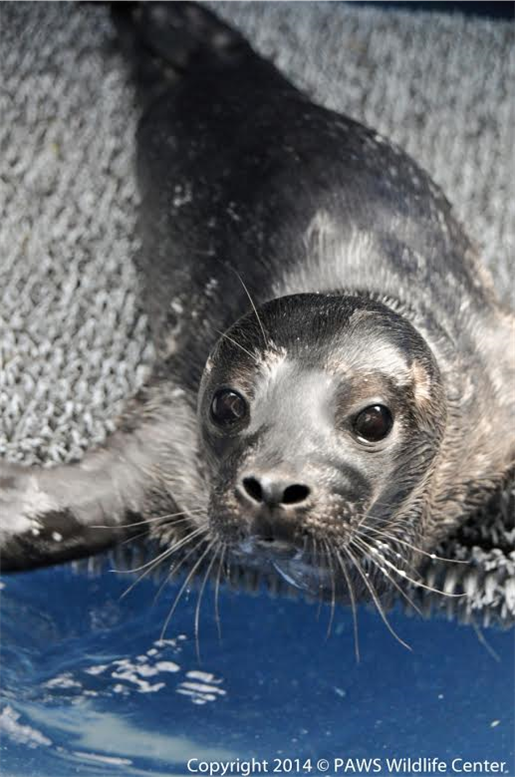 On July 9th, a harbor seal pup was reported on a private beach in Brinnon. The mother had not attended to the pup in 24 hours. Seeking comfort, the pup was calling out and attempting to suckle on some beach walkers. The reporting party observed a neighbor trying to feed the pup. On the 11th, Chrissy McLean checked on the pup and found it laying next to a dog! She decided to relocate the pup to Point Whitney to be on public land, near other seals, and away from people (and dogs). The next day, the pup was back into mischief, attempting to suckle a women’s toes at the Point Whitney boat ramp. 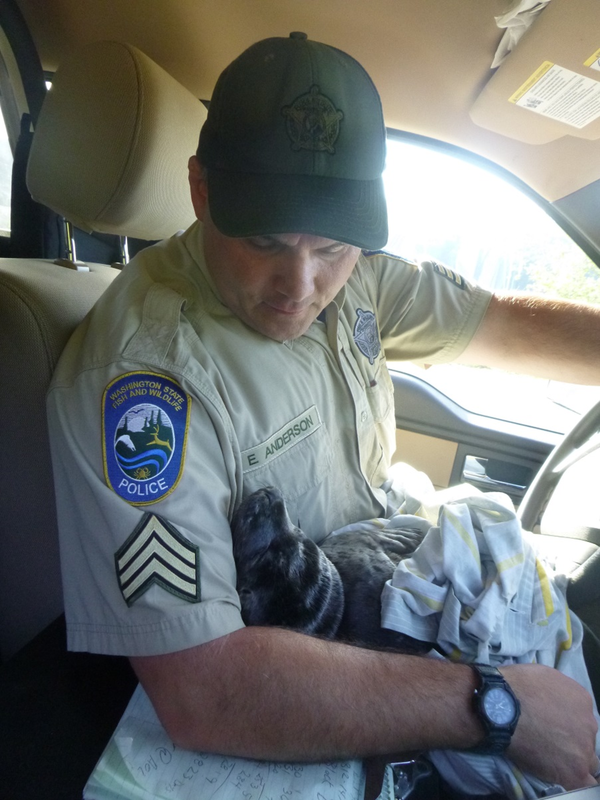 Sergeant Andersen of Washington Department of Fish and Wildlife picked up the pup. After so much human interaction and no mother to be found, it was decided to send the pup to a rehabilitation center. She was transferred to PAWS Wildlife Center. She stayed with PAWS for 68 days before being successfully released by NOAA at Jetty Island. Pictures: Left: EJC-2014-012 takes a rest in Sgt. Andersen arms before transport to PAWS in Lynnwood. Right: EJC-2014 -012 happy and healthy, hanging poolside at PAWS. The skeleton collection at the Natural History Exhibit has a new member. 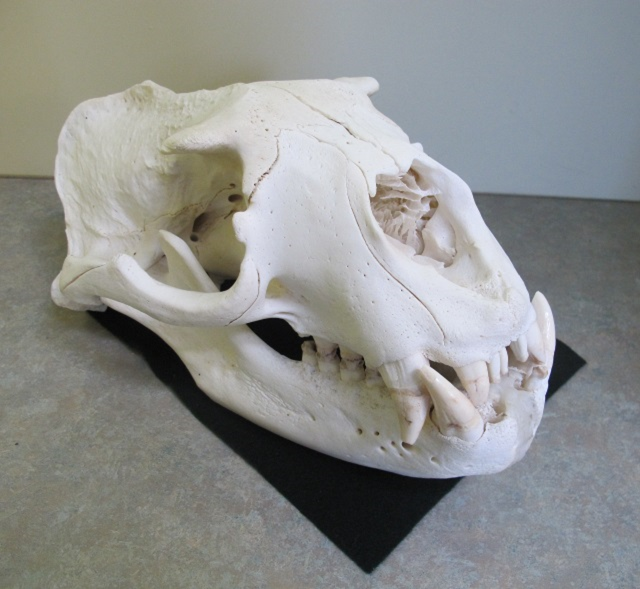 Come in and see a male Steller Sea Lion skull! EJC-2011-017, A.K.A Artemis, was spotted by a paraglider at Fort Flagler in November of 2011. After examining the carcass, Chrissy McLean and Jamie Montague collected Artemis’ head for the PTMSC education collection. Strangely, Artemis is lacking the diastema between the fourth and fifth post-canines usually characteristic of Steller sea lions. Collected tissue samples are sent to an Oregon State University lab to be tested for disease. 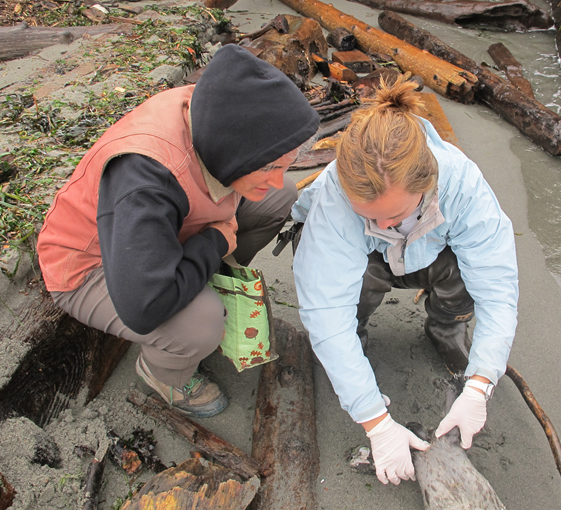 Right: Chrissy McLean and inter, Carolyn Woods perform an external examination on a harbor seal before making the first incision. Though necropsies can often bring out more questions that answers, this years necropsies did come up with some noteworthy results. Evidence of net impressions helped determine that one of our harbor porpoise and two of our harbor seals had suspect or probable fisheries interaction. This is a stark reminder that bycatch is still a challenge that marine mammals face in the Salish Sea. Without a dedicated stranding network, such problems would go unrecorded. Necropsy team members, Karen DeLorenzo, Carolyn Woods, Rae Bronenkant, Danae Presler, and Chrissy McLean demonstrate just how long the small intestine of a harbor seal is! Want to learn more about necropsies? Check out our new necropsy video! Learn about the data we collect and the importance of performing necropsies. Look for it soon on the PTMSC blog or on our Facebook page. Special thanks to Carolyn Woods, Danae Presler, and Matt Eschbach for their hard work. We will be having a training June 16th for new and seasoned responders alike. If you would like to brush up on marine mammal basics, go over protocol for responding, and hear about special cases, (among other marine mammal topics), RSVP to Erika. Our “Share the Shore” signs have helped PTMSC educate more people about marine mammal strandings than ever before! So you’re probably asking: what’s next? Well, we have more signs to install! You might have noticed that most of the signs are located in the northern section of our response zone. We are hoping to increase our outreach farther south. If you know an ideal location to install a “Share the Shore” sign, contact Erika. Photos of the location are appreciated. These cards are a quick and easy way to educate the public on the marine mammals in our area. We need your help distributing the rack cards. If you are interested, contact Erika. PTMSC is partnering with the Pacific Biodiversity Institute! 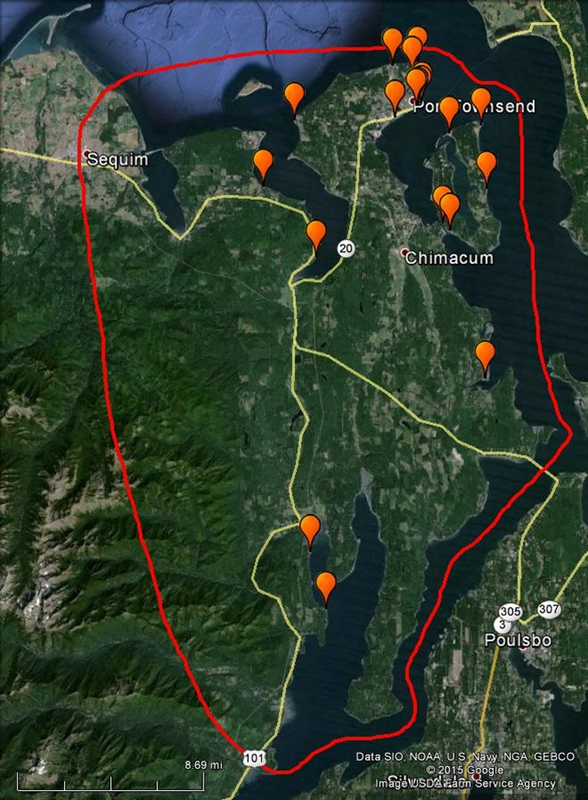 This spring and summer, we will be conducting shore-based observations of Port Townsend’s harbor porpoise population. 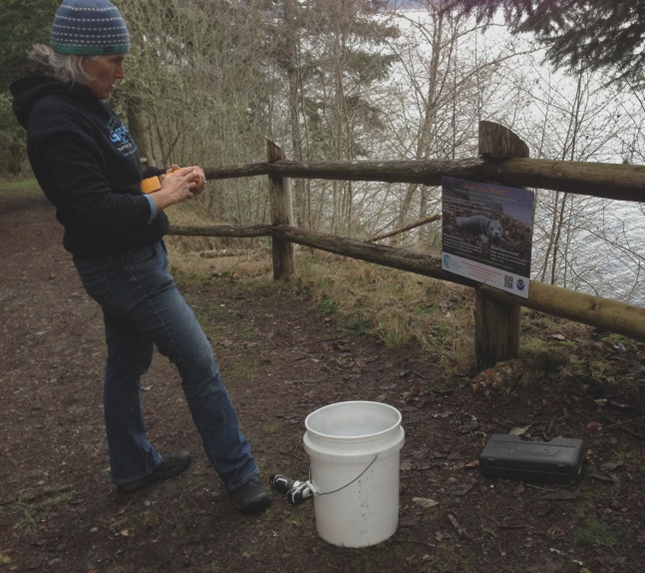 Data gathered from this project will help confirm acoustic recordings from our hydrophone and document porpoise behavior. This project is still in the planning stages, so stay tuned for future updates.